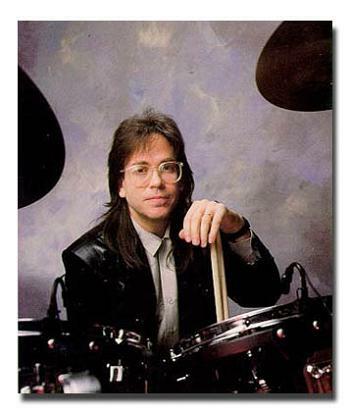 Born in 1954, son of the drummer and educator Joe Porcaro, Jeff Porcaro made him famous as a co founder of the Lighthouse American rock band of the 1980's: Toto (first album, 1978). Among Jeff's specialties, the blues shuffle with double strokes with the foot ("Purdie Shuffle"), the half time shuffle (swing rock) with swung ternary shifted rhythms with the right foot (in 3 over 4 polyrhythm: "Rosanna", called since the "Porcaro shuffle"), samba rock ("Africa", again a shuffle but binary, “à la” Steve Gadd) all of it with ghost notes. After a career as studio musician impressive, he died prematurely in 1992 at only 38 years old from an allergy to an insecticide. His death sparked a stir in the world of American Show Business and his funeral procession was followed by more than 1000 people, including many stars. 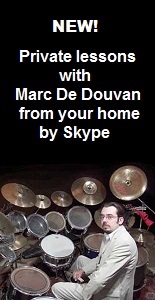 His "groove" and gesture mastery are as legendary as those of Steve Gadd or Vinnie Colaiuta (notably through the use of heel-toe, ghost notes, accents and hi-hat openings and rim shots). Simon Phillips and Gregg Bissonette will succeed him in Toto.